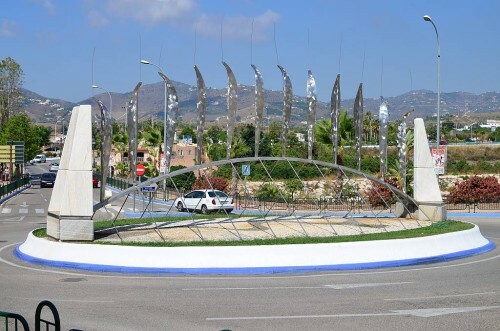 At the roundabout near the Supersol at the western end of town is this sculpture by Robert Halding. 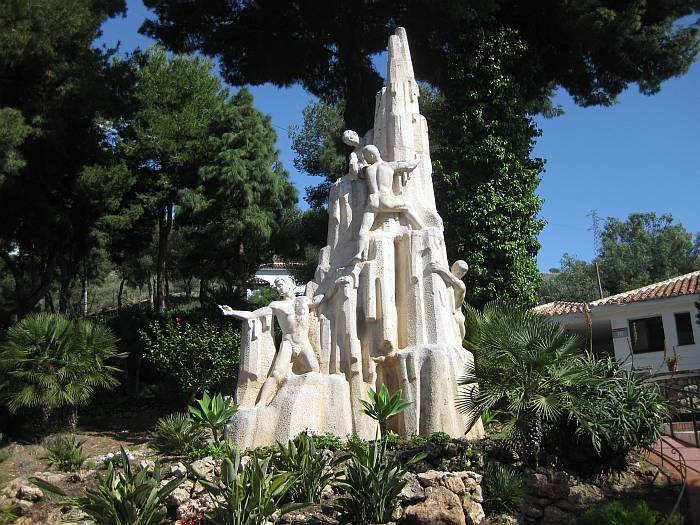 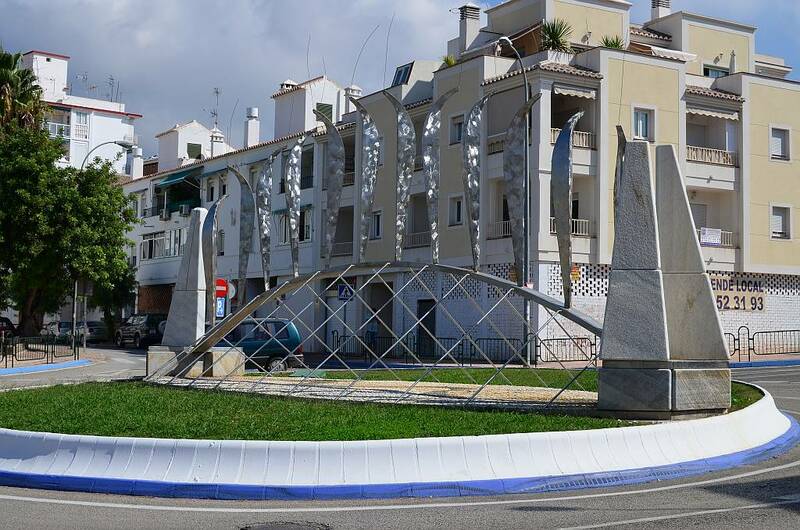 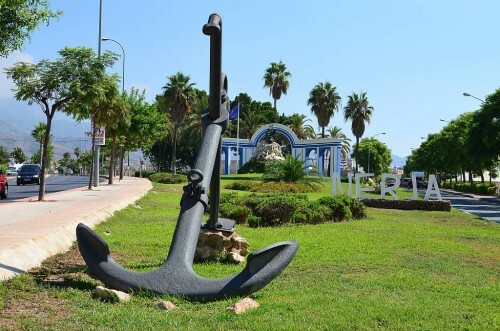 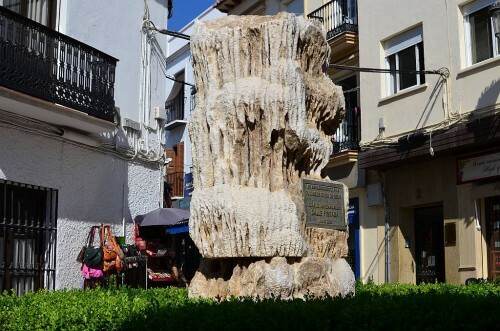 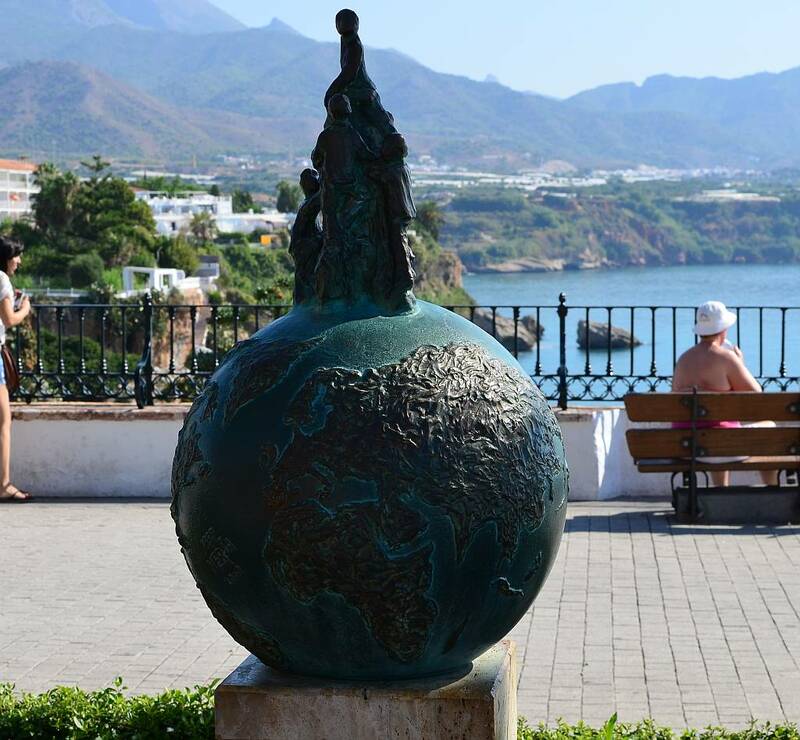 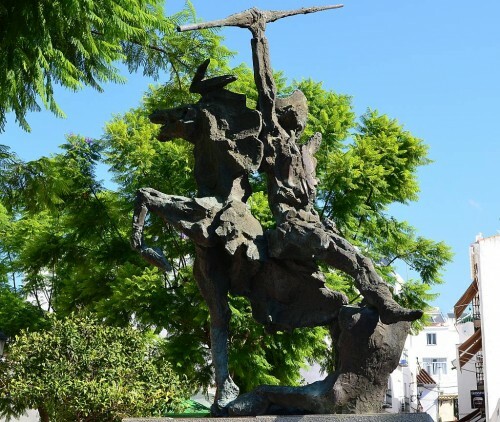 The sculpture by Robert Halding in 2005 is a symbolism of Nerja as a 'meeting' place and a nexus where different cultures, villages and even continents can join together. This coexistence is represented by its stone base in stark contrast to the steel structure, in this same respect one extremity has two monoliths (upright blocks of stone), suggesting a welcoming open door, while the other has just one monolith, transmitting the idea of continuity and affirming traditions. 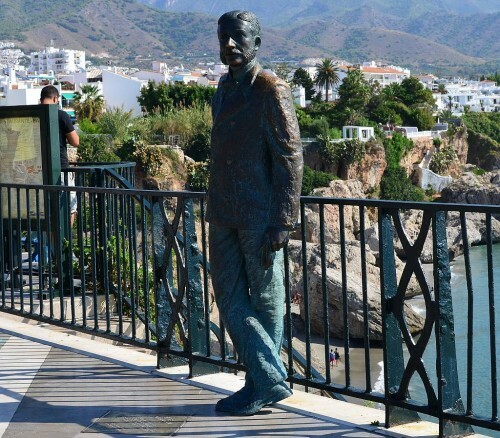 The figures on the bridge represent the people who visit Nerja, converting it in a cosmopolitan town. About half way up calle Pintada is this piece of rock from the Nerja Caves. 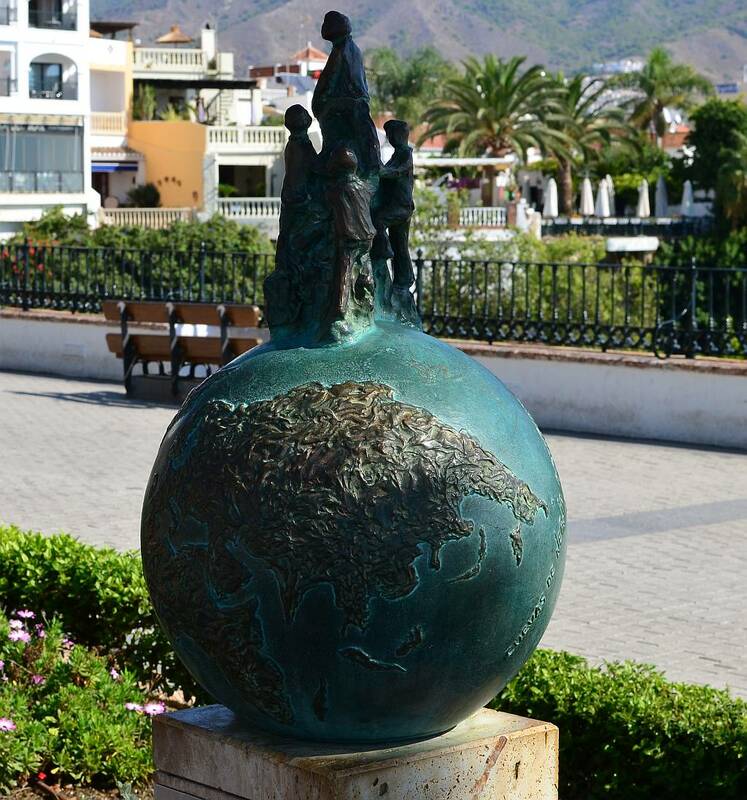 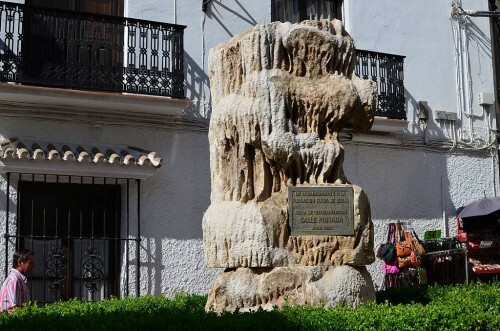 In calle Málaga, this piece of artwork is to be found. 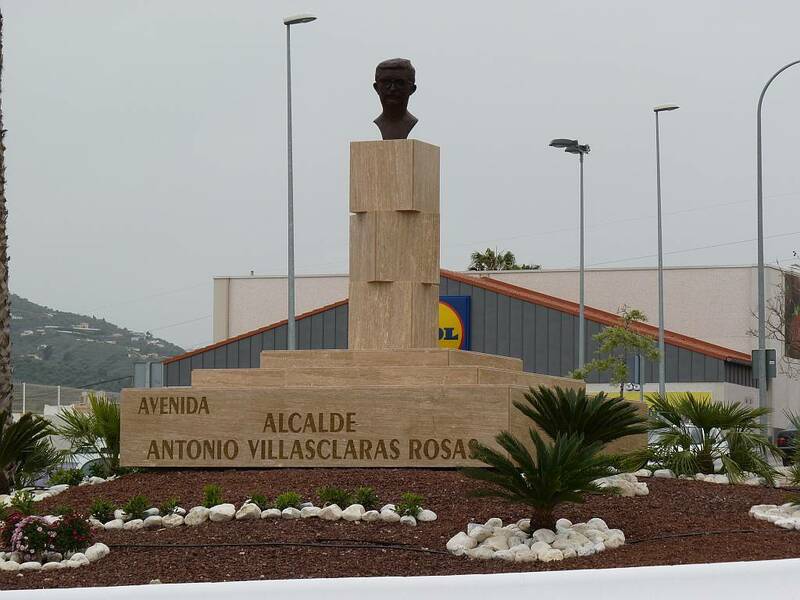 The sculptor is Aurelio Teno. On the Balcón de Europa is the statue of King Alfonso XII. Also on the Balcón de Europa is a small sculpture commemorating the discovery of the Nerja Caves by five young local schoolboys. 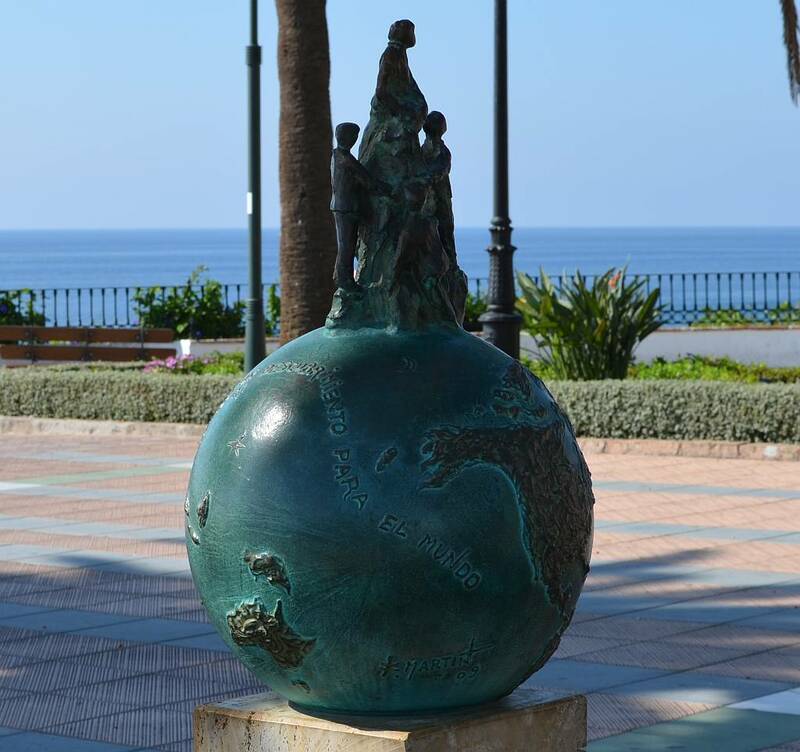 On the Paseo Maritimo Antonio Mercero - the Burriana beach promenade - is 'Antonio Mercero's Chair'. Antonio Mercero was the director of the famous 1970's TV series 'Verano Azul' (Blue Summer). 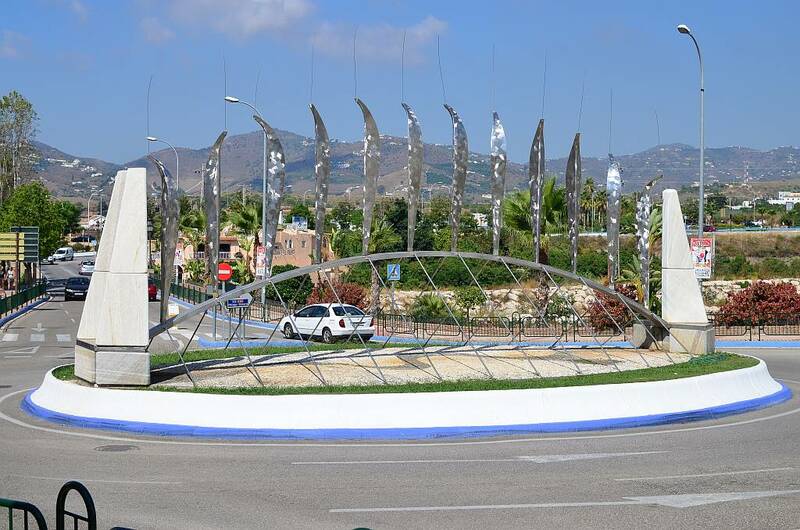 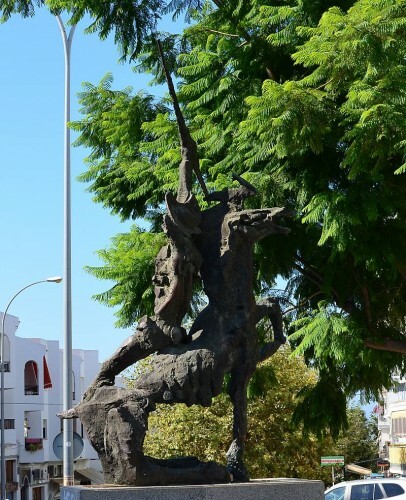 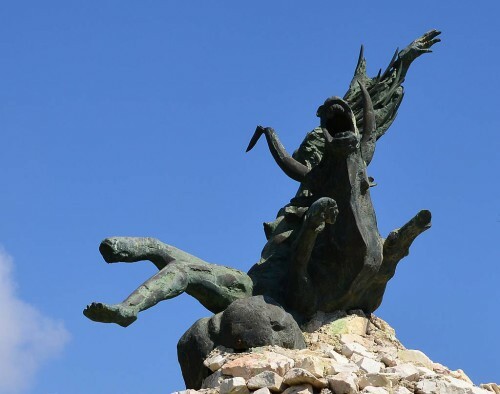 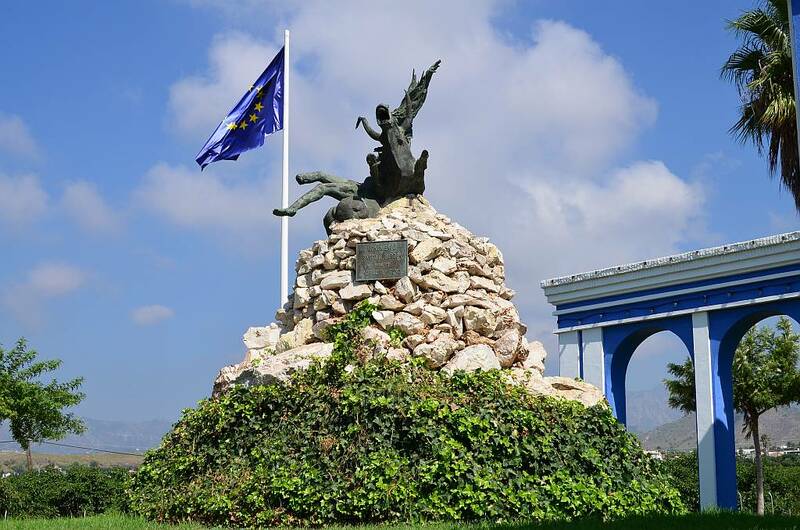 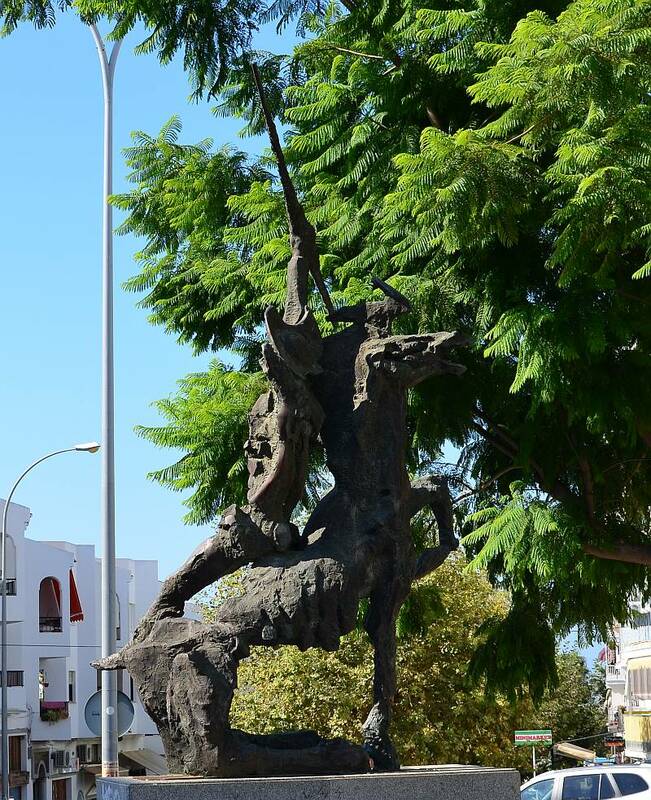 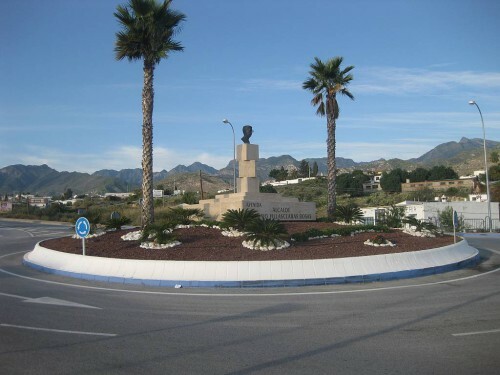 At the entrance to Nerja, arriving on the N-340 from Torrox, is the 'Rapto de Europa', another sculpture by Aurelio Teno. 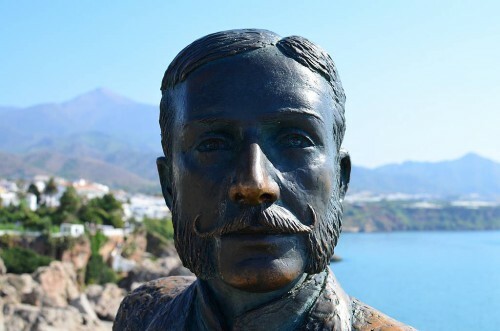 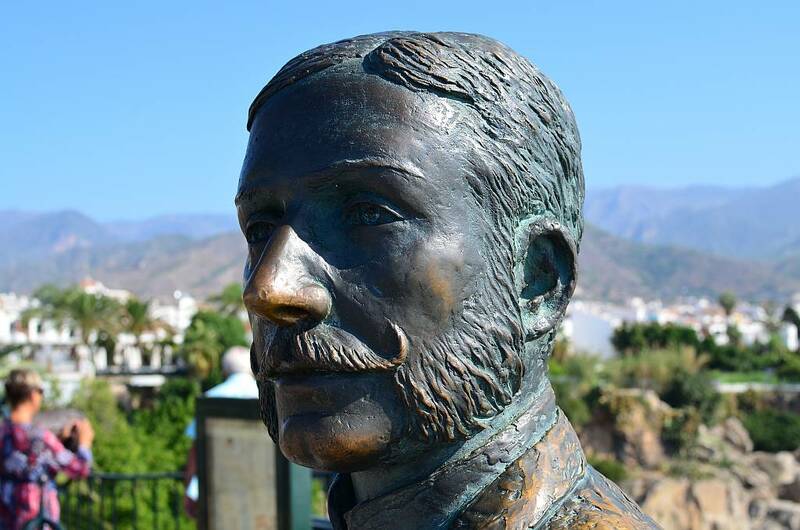 On the MA-5105 Frigiliana road, on the first roundabout, is this monument to a former Mayor of Nerja, Antonio Villasclaras Rosas. 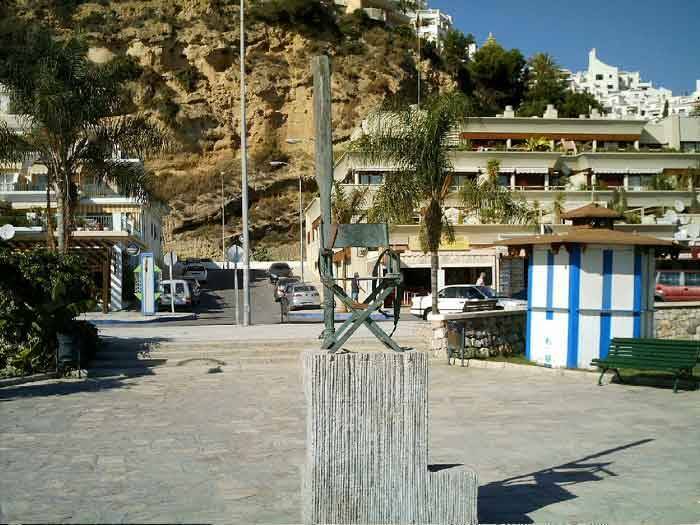 Outside the entrance to the Nerja caves in the village of Maro is a sculpture depicting the discoverers of the Nerja Caves.